Now officially licensed by Major League Baseball, the mobile game is built-in with the correct logos, team names and opening day rosters for this year’s season. It also comes with the option of playing three different historical seasons (1919, 1939 and 2012) or starting a fictional league from scratch. Once you decide on a league, your job is to take control over a single team and act as both their general manager and manager. That means you are in control of lineups, rotations, roster transactions and team strategies (though you can have the AI control these, if you wish). You can simulate games for days or weeks at a time, or you can manually play through each game on their own (still text-based, like OOTP). There are some limitations, however. There is no “commissioner mode”, and you will never be fired. This means that you will always control your original team and that team only. There is also a much lighter minor league system. Rather than having individual leagues (AAA, AA, A, etc. ), the game just takes a handful of a team’s prospects and puts them in one minor league pool. This is fine since the game is meant to have a simplified approach for mobile, but for those wanting full customization, you may be disappointed. The game’s interface is intuitive and fairly easy to get the hang of. Once you figure out the path needed to access certain screens (i.e. player stats, lineup customization, etc. ), moving around in the menus becomes a breeze. Loading screens were at the bare minimum, and everything ran smooth on my Nexus 6. 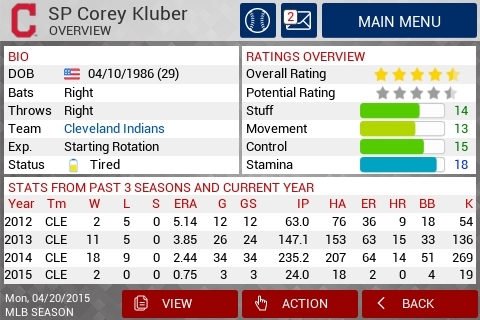 The team at OOTP Developments really did a bang-up job in making this accessible for everyone. – The Los Angeles Dodgers swept the Oakland Athletics in four games to win the World Series. – Other playoff teams: Toronto, Minnesota, New York Yankees, Colorado, Washington, St. Louis. – There was a rare three way tie for 1st place in the NL Central. The Cardinals, Reds and Cubs all finished the season with a 90-72 record. St. Louis won its one-game playoffs against both teams to advance to the division series. – Washington had the best record (100-62), whereas Philly had the worst (64-98). – Mike Trout (.318, 28 HR, 106 RBI) and Ryan Braun (.315, 36 HR, 119 RBI) won the MVP awards. – Masahiro Tanaka (17-8, 2.78 ERA) and Stephen Strasburg (21-6, 2.50 ERA) won the Cy Young awards. – Dalton Pompey (.276, 23 HR, 94 RBI) and Joc Pederson (.269, 23 HR, 66 RBI) won Rookie of the Year. – Oddly enough, A-Rod was immediately enshrined in the Hall of Fame once the season ended. – There were *a lot* of trades and injuries, including several blockbuster deals that happened as soon as the season was complete. That last point is probably my only real complaint about the game. I simmed week-by-week in that season, and it seemed like at least once per week there was some type of injury to my ballclub, including several that were months long. There were also an absurd amount of trades, including many that involved multiple superstars (i.e. the Mets trading Matt Harvey to the Cubs for Anthony Rizzo and a couple prospects). These were issues on the default settings of OOTP 16 as well, but at least the frequency could be manually adjusted there. In MLB Manager 2015, your only option is to disable injuries and/or trades entirely. In this instance, a couple of new settings would be much-welcomed additions to the game. Still, it’s hard to complain too much when the game manages to pack so much else into its mobile form (especially at a price point of just $4.99!). 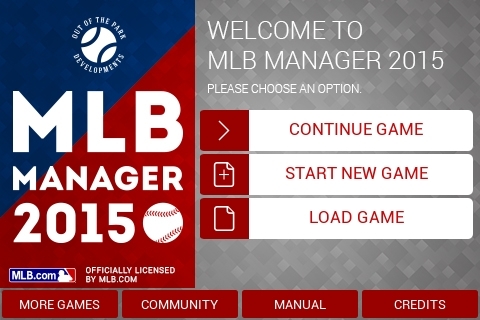 For baseball enthusiasts looking to get their fix on the go, MLB Manager 15 is hard to beat.